The crowdfunding campaign is successfull and finished. Thanks to all contributors for their support. It allows for video shooting and most of the part of the postproduction. If you want to help to finalize the post production of the documentary (soundtrack and subtitles), it's still possible ! To follow the adventure during this summer, you can visit the facebook page, or the website. 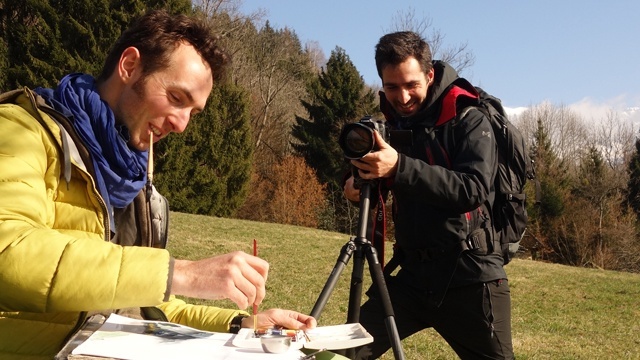 A 4-month solo trek across the Alps and the making of a documentary film. 52’ to rethink our concept of time, relation to people, material things and about our place in the environment. A 2500 km distance, 150 000 m ascent, 8 countries, my “home" and a filming kit in my backpack ; a sporting, technic and artistic adventure to come. 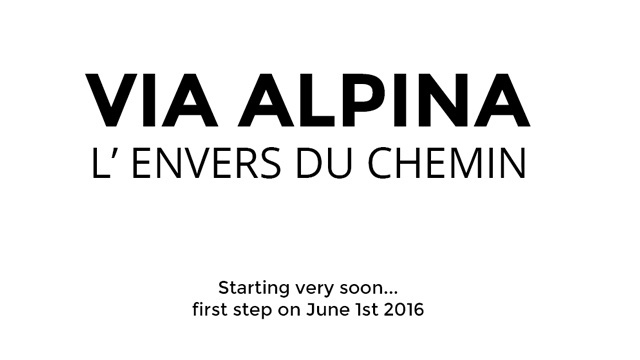 Start planned the 1st of June 2016. This documentary film is made for you and cannot exist without you. Thank you for your support. 100 % LEVEL 1 : Completed ! Video Shooting guaranteed ! A very big "MERCI" to all of you. Let's start ! LEVEL 1 100 %, Video Shooting is guaranteed and the production of the documentary is on the good way but will require additionnal external support to be completed. Crossing the entire range of the Alps is a dream that has been on my mind for a long time. 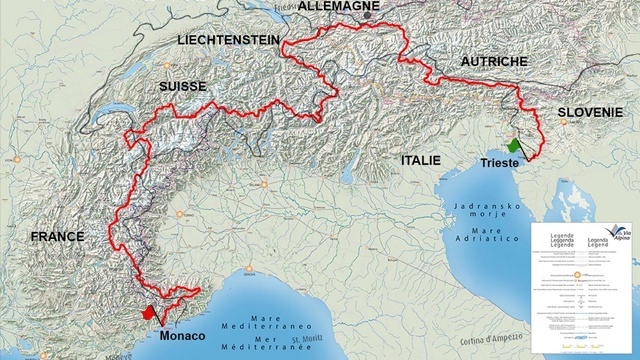 This summer, alone and partially self-sufficient, I will follow the red trail of the Via Alpina over 4 months, from Trieste to Monaco travelling through 8 countries, and spanning 2500 km. By making a documentary film along the way, this adventure is also aimed at introducing people to the secret powers of long distance trekking in mountains. Besides the physical challenge, this trip is a long distance journey which is a chance to rethink our concept of time, relation to people, material things and about our place in the environment. Through the unusual situations experienced and several interviews with trekkers, you will be immersed in the long distance trekkers parallel world and follow its slow transformation. This documentary project is an extension of the essay I wrote during my mountain leader training some years ago. The title is “The Benefits of Trekking in the Mountains : from Physical Well-Being to Self-Awareness”. Start from Trieste in Italy, then crossing 8 countries to end in Monaco 4 months later. 2500 km, 150 000 m ascent with a trail between 0 and 3000 m height. 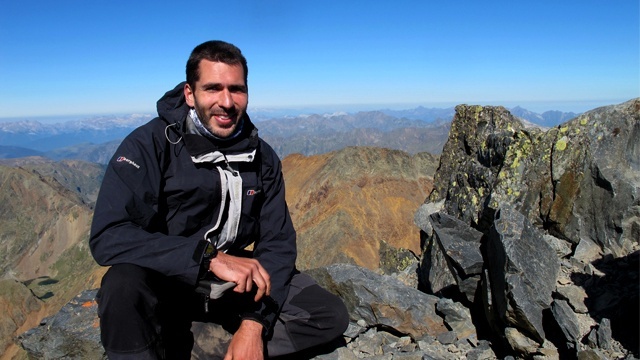 5 years after a long trek along the Pyrenees that changed his life, Matthieu is back on the hiking trails for 4 months with an idea : looking for the secrets of hiking in the mountains and bringing it to light. Through trekker’s testimonials and diary anecdotes, this is a singular world which appears. We discover that far from only being a physical activity in an amazing scenery, long distance hiking acts as a catalyst which activates deep transformation.
" 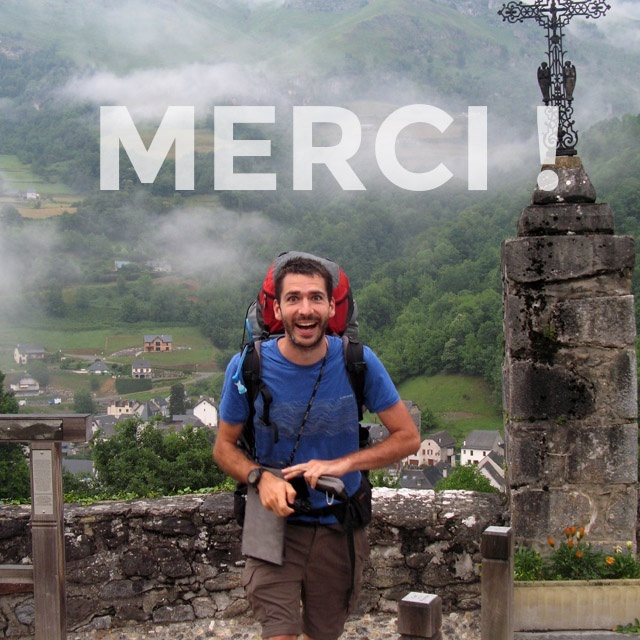 In 2010, in a chaotic period of life, I decided to hike across the Pyrenees on a solo 54 day trek from the Atlantic Ocean to the Mediterranean sea. This adventure has changed deeply my outlook on life. I became curious about the benefits of hiking in the mountains and all the mechanisms involved in the process. This topic became eventually the subject of my thesis for my degree as a Mountain Leader. Using results from a survey that attracted 200 people, and several books on of the topic, I managed to establish some explanations. Now, I want to deepen these first results and focus on long distance trails by being in the situation and interviewing other trekkers. 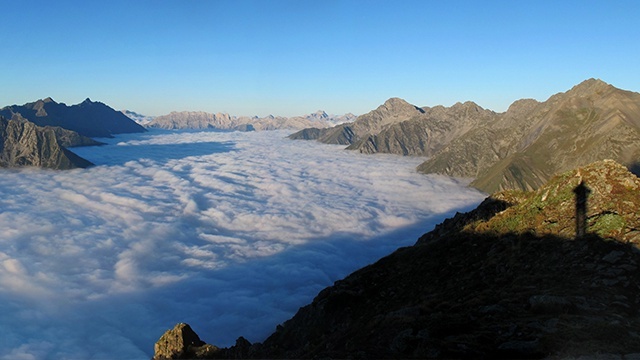 The investigation will be carried out over 4 months along the Via Alpina, an international hike which across the main Alpine range connecting Trieste to Monaco, across 8 countries. In a society that is ever more demanding and hectic, more and more people need to take a break to step back from their daily life. Some people travel the end of the world, others change their professional activity, and then there are the ones who decide to go hiking for several weeks, if not months. While the Compostela's pilgrim route has become a very famous and classic hike for this kind of adventure, long hiking trails in mountains remain less known. The isolation and commitment of being in the mountains as well as the natural and wild aspect incline trekkers to plunge into another dimension. Besides hiking in mountains, the documentary also raises our relationship to time, to people, to material things and our place in the environment.Allowing time for ourselves and keeping our body in motion bring about a better understanding of ourselves, of our relationship to our body, to other people, to our life. The documentary will deal with the different topics through surprising situations experienced during the hike, and other trekker’s testimonials. " 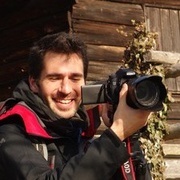 A mixed team of professionals and volunteers from the Grenoble area is responsible for the post-production of this documentary. Video and sound mixing will be made by professionals used to mountains films to guarantee a high quality result. Filming will be done with a DSLR and a GoPro to produce full HD quality image. Sound will be recorded by multiple devices to guarantee high quality results in all conditions. This project is far from being just a solo trip in the mountains, this is why I am asking your support !The documentary film is for you and cannot be produced without your help. The voluntary work I am doing is aimed to convey a message which is important to me. To guarantee a high quality result, video mixing and sound mixing will be done by paid professionals used to mountains films post-production. I need also to purchase adapted audio and video equipment. I cover the trek cost with the help of sponsors from which I am awaiting answers. I will adapt the trekking equipment following the partnerships succeeded. I am also covering part of the costs to the purchase of audio & video equipment. Video shooting and post-production are guaranteed. No matter what is the amount you are giving, every contribution is a step forward to build this project ! To contribute, choose one of the rewards on the right of the screen, ulule will ask you then to create an account. Follow the instructions and become a co-producer of the documentary film. Crowdfunding campaign works principally from people discovering the project from social networks. Share the campaign (top left button of the page) or share the facebook page, it will make the difference ! Originally from Lyon in France, I had the opportunity to travel a lot during my studies and my first years of work in the architectural lighting design field. Beyond having discovered several cultures and ways of living, this experience broadened my horizons and gave me the confidence to take on a variety of projects. My passion for mountains stretches back to a 6-month trip in South America along the Andes. Back in Europe, I crossed the Pyrenee (a mountain range separating France and Spain), a 2 month trek. This life-changing experience convinced me that I had to bring this activity to as many people as possible. Today, having become Mountain Leader, I split my time between Environmental education with schools, treks and snowshoeing treks with private clients and the occasional job in the architecture field. 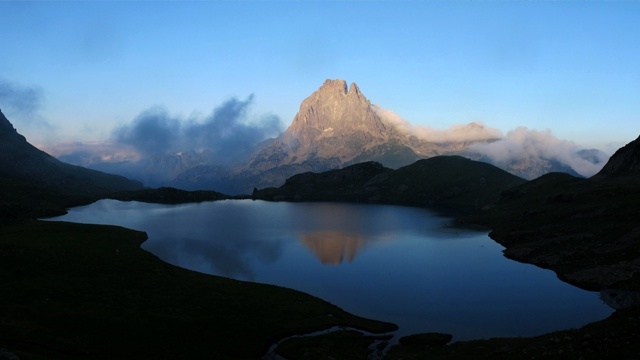 A solo 54 day trek across the Pyrenee in 2011 deeply changed my life. Deprived of media, internet and reduced to the essential to live, I have relearnt to listen to my body and to awake the little voice that was sleeping within myself. A trek full of good times shared with people, magical moments, hard blows... similar to moutain shape. I am now transmitting this passion for long trek as mountain leader along self made itineraries in the Alps. I am also organizing courses about orientation and survival techniques. This is one way to encourage people to build up their own adventure, the making of this documentary is another. ​I have always been very sensitive to the quality of light and particularly to the fantastic variations of daylight. Light strongly influences our way of perceiving materials and spaces. Photography is an extension of this sensitivity and my work as architectural lighting designer is also connected to its duality light & material. Recently I got interested to video, I am now making several testing sessions to prepare the travel and guarantee high quality image and sound for the documentary. Fortunately I am surrounded by experienced professionals who supervise me in this training time.